It might seem that Dynamo Combo is a very useful application because it promises to help you save money at online stores and provide tools for searching the web. Unfortunately, the program will not do anything beneficial for you because it is nothing more than just an advertising-supported application. 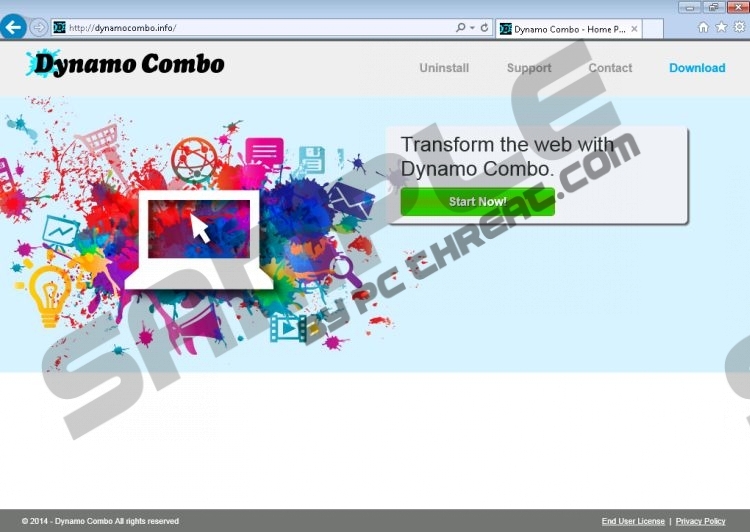 Dynamo Combo is published by Super Web LLC and it is a rather old adware program; however, our security experts believe that it might still enter your system. The program is compatible with all the most popular browsers, so you will definitely notice its presence if it happens that it enters your system. Have you already detected this adware? If it is true, you should delete Dynamo Combo as soon as possible because this program might cause you serious problems associated with your system's security. As Dynamo Combo is an advertising-supported application, it will definitely flood your browsers with various in-text, interstitial, video, and pop-up advertisements. In this sense it is similar to such programs as Byte Label, NetGranule, Masponi, and Cling-Clang. It is not advisable to click on ads because it is not known whether reliable links are embedded into them. If you wonder what this means, you should know that you might be routed to unreliable websites. Dynamo Combo is not responsible for your safety in any way, which means that you use this software at your own risk. If you do not want to experience security-related problems, you should hurry to remove Dynamo Combo from your computer. Continue reading the article in order to find out how to get rid of this untrustworthy application. Advertising-supported applications not only show commercials, but might also perform other activities behind your back. The specialists at pcthreat.com have found that Dynamo Combo might gather data about your online activities in order to provide you with relevant advertisements. It can be assumed that Dynamo Combo seeks to lure computer users into clicking on ads. Luckily, the program is interested in non-personally identifiable information only; however, it is unclear whether third-party advertisers do not collect personal details either. You should remove Dynamo Combo from your system the moment you detect it because this program is untrustworthy. You can delete the program by scanning the system with an antimalware tool. If you use a trustworthy security application, all other infections will be deleted from your computer as well. Make sure that your antimalware tool is enabled all the time if you want to prevent similar unwanted programs from entering your system in the future. Click on the program that you wish to remove. Quick & tested solution for Dynamo Combo removal.